— Wow! This can be one particular of the most beneficial blogs We have ever arrive across on this subject. Actually Excellent. I am also an expert in this topic so I can understand your effort. — Really properly written story. It will likely be valuable to anyone who usess it, including yours truly. Maintain up the excellent function – can’r wait to read a lot more posts. — You made a few nice points there. I did a search on the matter and found a good number of persons will go along with with your blog. — Aw, this was a extremely nice post. In thought I want to put in writing like this moreover, taking time and actual effort to make a extremely great write-up, nevertheless what can I say? I procrastinate alot and definitely not appear to get one thing done. I wonder what spammers will have to say about this post. Have a nice weekend and maintain up the excellent function, everyone! I have to admit, I’m not really sure what the point of spamming a blog is. So, if I approve the comment and it shows up on my post, then what happens? My readers my click on it? And then what? I’m just not sure if all the effort of spamming a blog pays off. I just worry they could lead to viruses. So I delete all of them. I love this! I chuckled reading these. “Actually Excellent”. 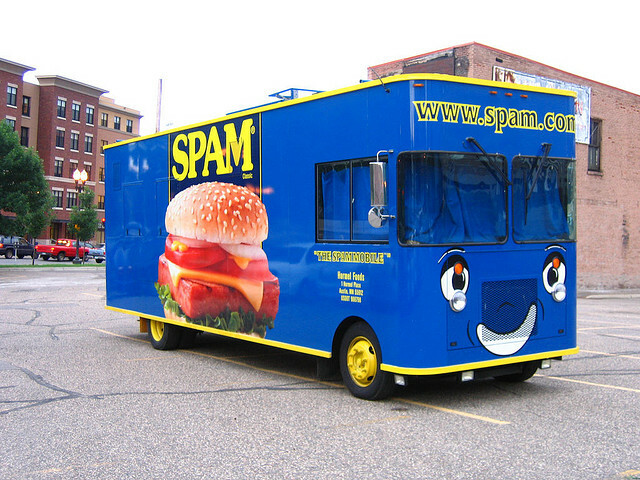 And the Spam truck is marvelous. What a happy truck! I know. They’re so bad, they’re good. This is the second post I read today about spam issues happening again. Touch wood, I am not afflicted . . . yet. You’re lucky. I almost started getting spam right away. Geesh. I get those spam messages, too. I guess their sole intention is to make a big number of sites linking to the spammer’s client sites. Color me naive. I would have thought that one or two of those comments were written by ESL-challenged visitors and would have been warmed by their compliments. WordPress is pretty good at picking out the spammers. Many of them send out a gazillion posts a day, or exactly the same post a gazillion times. They want you to think they are reading your blog, even include some of your post titles in their spam. That’s pretty tricky. I believe the way WordPress is setup is that if you approve any comment and allow it to appear on your blog then it assumes you’re OK with more comments from that source appearing — you’ve cleared that person to comment. That could open the floodgates of spam (if that isn’t an odd image) pouring onto your blog. What amazes me is why we can’t set up WordPress to just reject and trash the spam so we never even see it. Perhaps that’s a premium feature you have to pay for? The time it takes to delete the spam is annoying, and I have yet to find a spam folder comment that is genuine and put there by mistake, though a few times a genuine comment seems suspicious — the commenter makes no specific reference but simply says “Wow!” But the email address is usually a giveaway. At least for me, WordPress puts the suspected spam into a separate folder and I just need to scan them quickly, then select all and delete as a group. So I don’t spend too much time getting rid of spam. I only approve commenters that I know are real people. So far that’s been working for me.